The photo above is not that great, because obviously I missed the dog. But the photo reminds me of a funny moment. 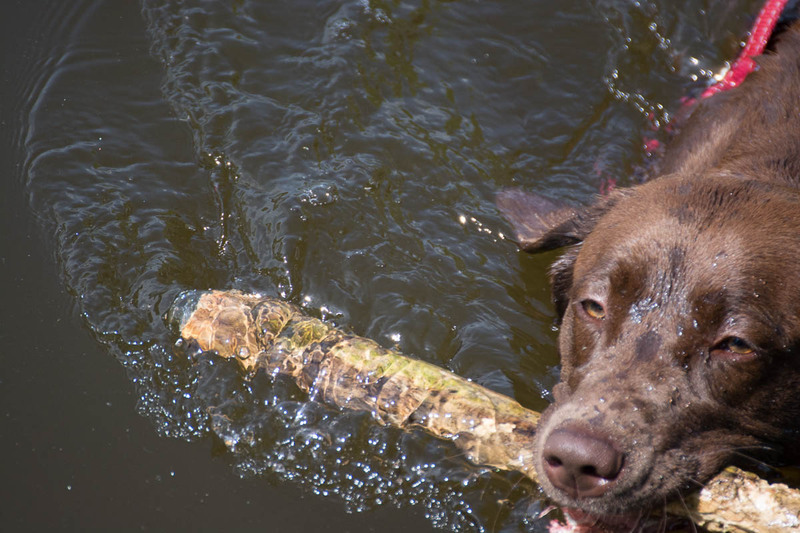 When I hiked, there was this guy with a brown dog and he threw a stick into the water and his dog jumped into the water to bring it back. Meanwhile, I was standing on a footbridge and thought I could take a photo of the action. But before I took the shot, the owner of the dog yelled “You know that you owe me 100 Euro if you take the photo?”. While this guy seemed to make a joke, it confused me so much that I missed the dog. That’s the reason why the dog is not completely in the frame. The guy yelled in a neutral tone, and I am sure it was some kind of dry humor, but you never know. I wouldn’t wonder if someone would be serious about this, but the person would be wrong since it’s not forbidden to take a photo of a stranger`s pet in public. But then again, I am pretty sure it was a joke in this case. It distracted me well (laugh). Oh, I never thought about that, really. So pets are ok, but people are not, or? I’m not familiar with the law when it comes to this. Yes, that’s how the law is in Germany. In the case of a person, you would need their permission… in the case of pets in the public you don’t. So, if you just photograph the pet of that person, it’s ok. But it must be in the public, because if you would use a tele lens and photograph the pet behind the hedge in their garden or on their property, it could count as “invading their privacy”. But if they go out with the dog, you can take the photo of the dog. Good point about the not fully framed pictures… it also makes you imagine why it was shot that way, how the subject looks like. When things are missing, your imagination starts, because your eyes don’t get all information’s. I saw a couple of photos of other people, where they didn’t have the subject fully in frame.. my eyes searched more, and my imagination started. Aha I see, thanks for clarifying.